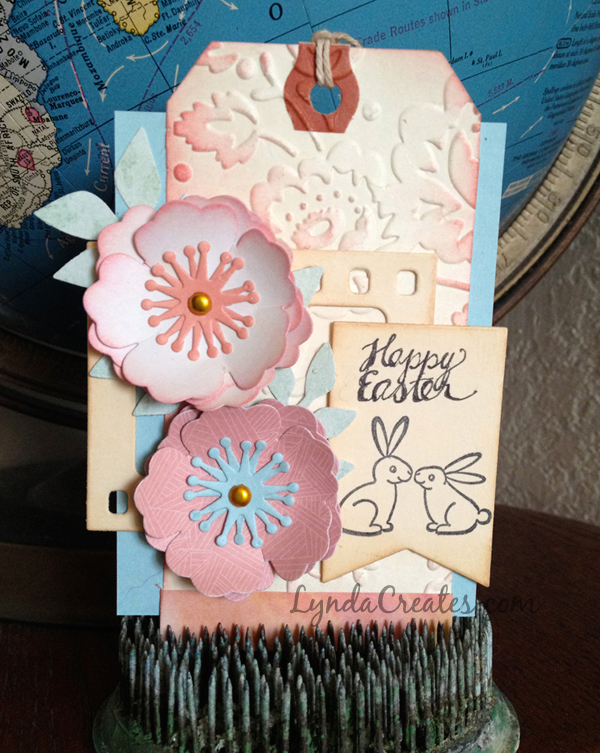 The talented designers at the Designer Crafts Connection group have chosen to share an Easter project as part of a Blog Hop. I couldn’t resist using some of the baby bunnies from my new Sweet Baby Clear Stamps in an Easter project. I began with papers from the Sizzix Basics , Geometrics and Fox Tales paper pads. I wanted shades of blush, peach and aqua with a hint of green. I started by cutting a 3″ x 4″ rectangle from the aqua paper to use as a base. Next, I used a 2 1/2″ x 4 3/4″ tag and embossed it using the Floral Tapestry Textured Impressions Folder . I lightly inked the edges with Worn Lipstick Distress Ink Pad . I added a piece of Simple Stories Summer Vibes Washi Tape along the bottom. I adhered the tag to the rectangle. For added interest I die cut a “filmstrip” shape using a die from the Documented Die set . I inked the edges with Distress Ink Pad, Tea Dye and adhered it to the tag. I wanted this layer to be interesting but still be able to see the detail behind it. I die cut a banner from the same Documented Die set . I stamped the bunnies using my Sweet Baby Clear Stamps . I layered this on top of the filmstrip piece. Next, I die cut a little branch using the Spring Greenery Die and adhered that on top of the film strip. Here’s where I would have done it differently IF I had the Tattered Florals Die , but I didn’t so I made do with a flower shape and had to cut about 1/4″ to separate each petal. I did this so I could curve the petals to add dimension using a pencil and rolling each petal inwards. I inked the edges using the Worn Lipstick Distress Ink . I’m not sure of what die I used to cut the detailed centers of the flowers. I used a 1/8″ punch to put a hole in the center of the flowers and used a small gold brad to hold it all together. Then I glued the flowers to the tag. This was so simple and I used supplies from my stash. I hope you enjoyed this project. Please check out the other Easter projects by the talented designers at the Designer Crafts Connection blog hop. And please Follow, Share or Comment. I would love to hear from you. Thank you and Happy Easter! I love the embossing on this project. Hi Laura, Thank you. Glad you stopped by. Very sweet Easter tag. Love all the layering. Thanks for linking up to Merry Monday! Sharing on MM Pinterest board! Have a great week! Hi Kim. Thank you for the nice comment. Glad you like the tag.